Seattle has become the second city to showcase a ‘sperm bike’ making sperm deliveries from a sperm bank to fertility clinics. 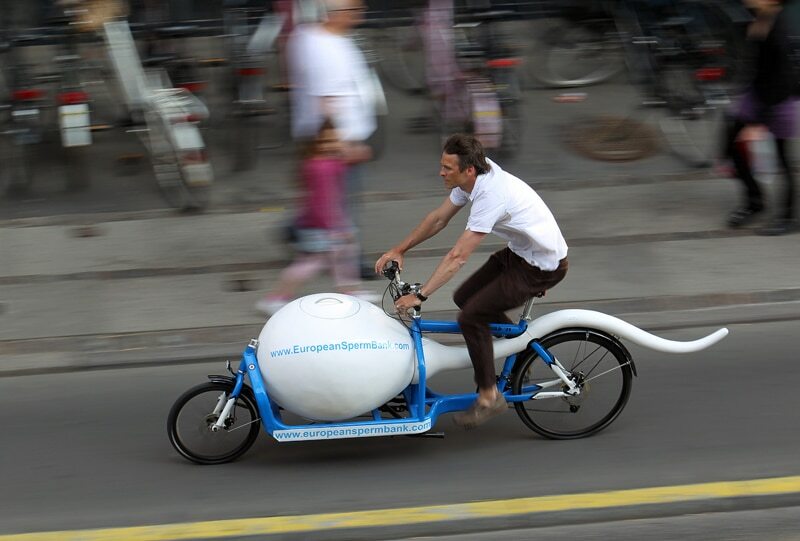 The European Sperm Bank, one of the largest in Europe and located in Copenhagen, Denmark- perhaps the world’s most bike-friendly city- made news reports globally after it began deliveries in a custom-designed bike with a cooling system built inside the ‘sperm head’ for storing tanks with sperm specimens. The European Sperm Bank’s Seattle lab (www.seattlespermbank.com) worked with Portland’s Splendid Cycles and Antimatter.com to construct the sperm structure, built of Jesmonite on top of a Bullitt cargo bike. With the tail, the bike is 9 1/2 feet long and weighs about 110 pounds fully loaded. The Seattle version includes a small electrical motor to give riders a boost on Seattle’s many hills (unlike flat Copenhagen, where the assist is not needed). Deliveries from the sperm bank’s lab will be cycled to Seattle Reproductive Medicine, at 1505 Westlake Avenue, and to Pacific Northwest Fertility & IVF Specialists, at 1101 Madison Street, utilizing the Burke-Gilman Trail past the University of Washington campus, and then travelling up Madison Street to Seattle’s First Hill. Look for it daily!